02/04/1988; Concert at Streets, New Rochelle, NY, USA. 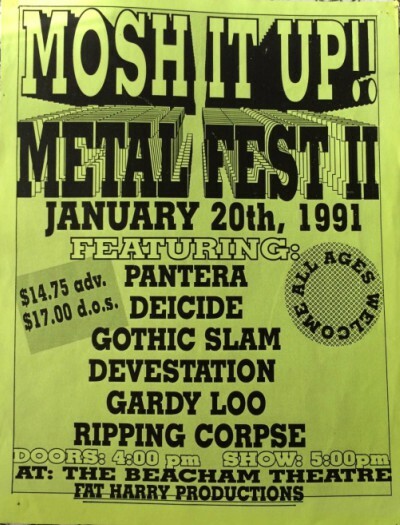 opening for Whiplash.
? 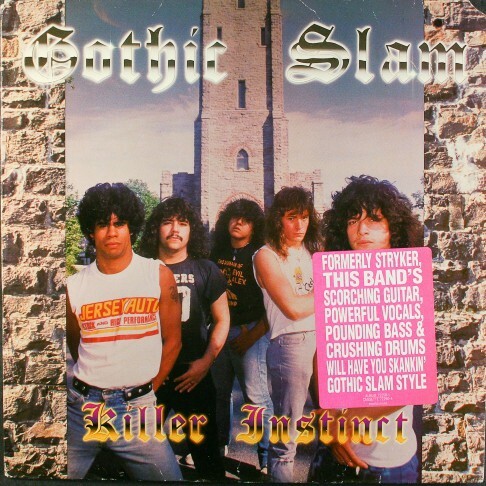 ?/04/1988; 'Killer Instinct' album released. 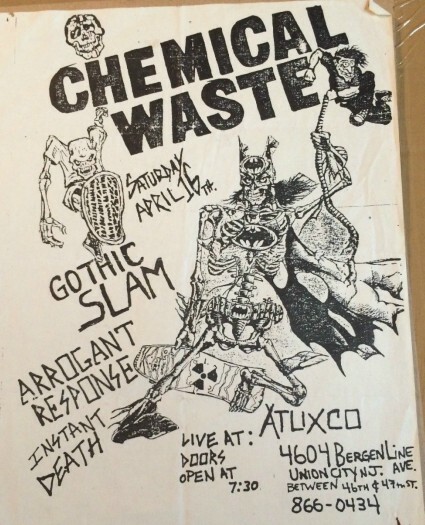 16/04/1988; Concert at Atuxco, Union City, NJ, USA. opening for Chemical Waste, with asst. 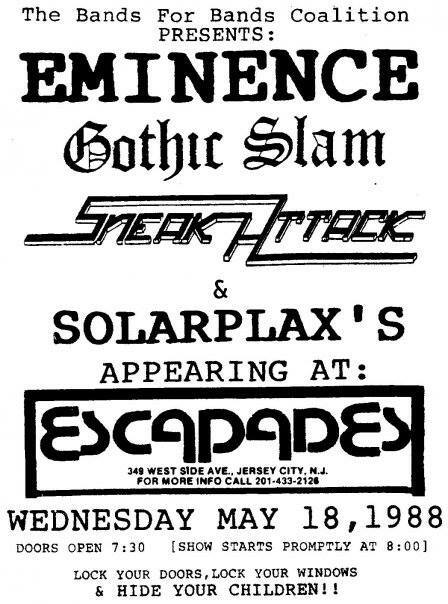 18/05/1988; Concert at Esapade's, Jersey City, NJ, USA. opening for Eminence, with Sneak Attack. 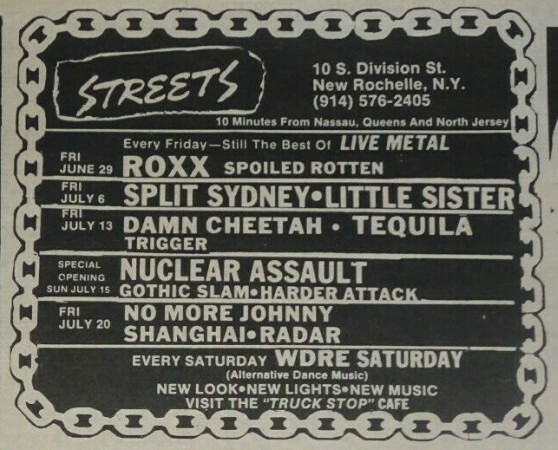 28/05/1988; Concert at Streets, New Rochelle, NY, USA. opening for Hades. 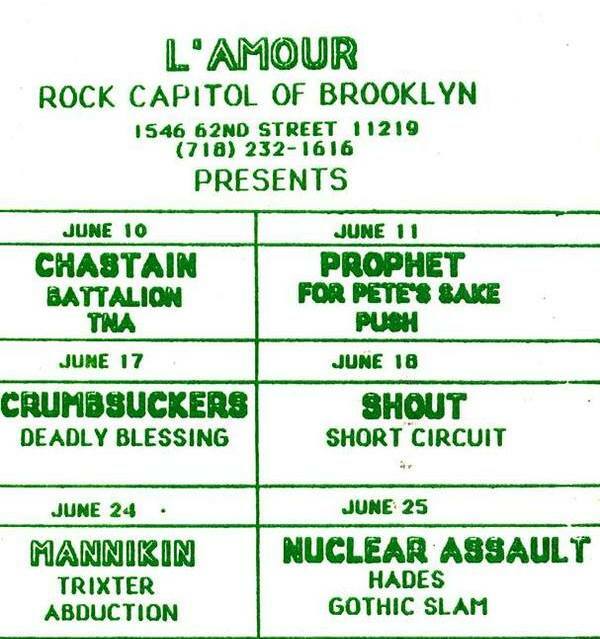 25/06/1988; Concert at L'Amour, Brooklyn, NY, USA. opening for Nuclear Assault & Hades. 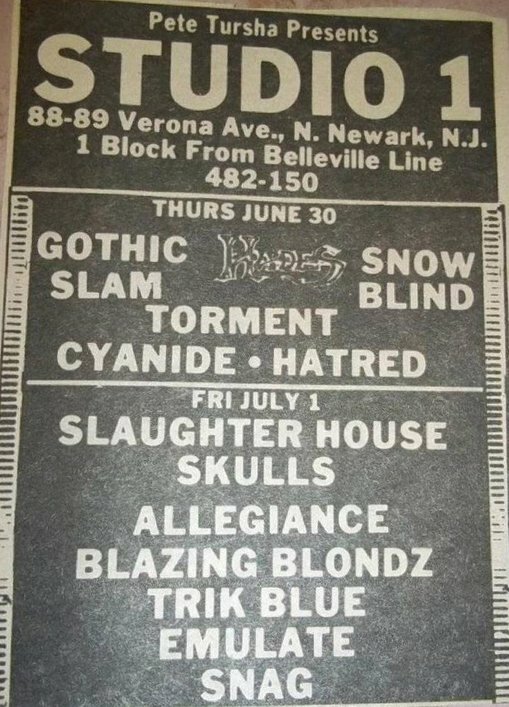 30/06/1988; Concert at Studio 1, Newark, NJ, USA. with Hades, Snowblind & asst. 09/07/1988; Concert at Streets, New Rochelle, NY, USA. opening for Nuclear Assault, with Mach Mxx. 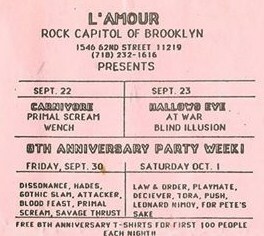 30/09/1988; Concert at L'Amour, Brooklyn, NY, USA. with Blood Feast, Hades, Savage Thrust & asst. 31/10/1988; Concert at Zone D.K., New York, NY, USA. 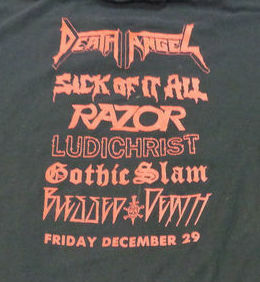 with Antidote, Arrogant Response, Lost Souls & Wench. 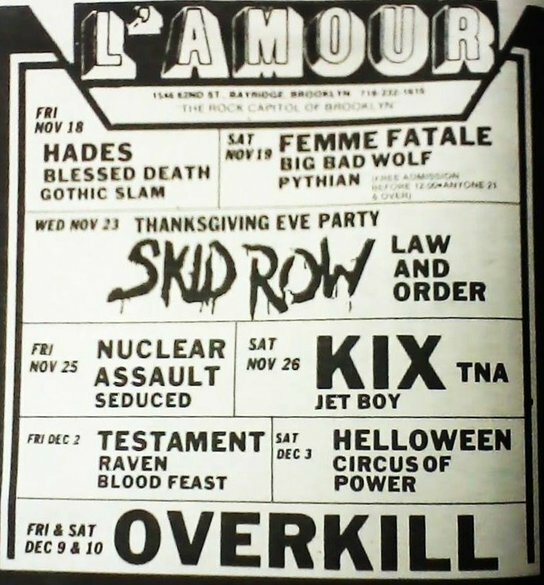 18/11/1988; Concert at L'Amour, Brooklyn, NY, USA. opening for Hades & Blessed Death. 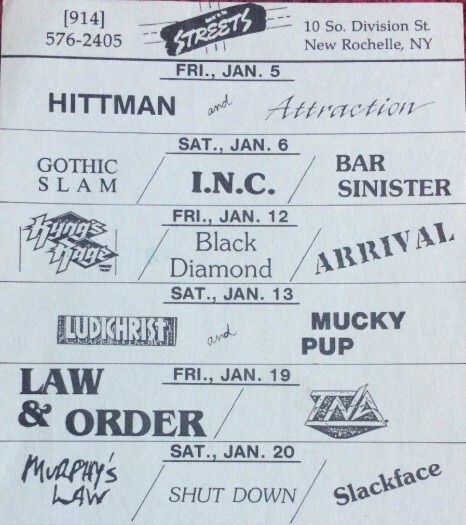 21/01/1989; Concert at Streets, New Rochelle, NY, USA. 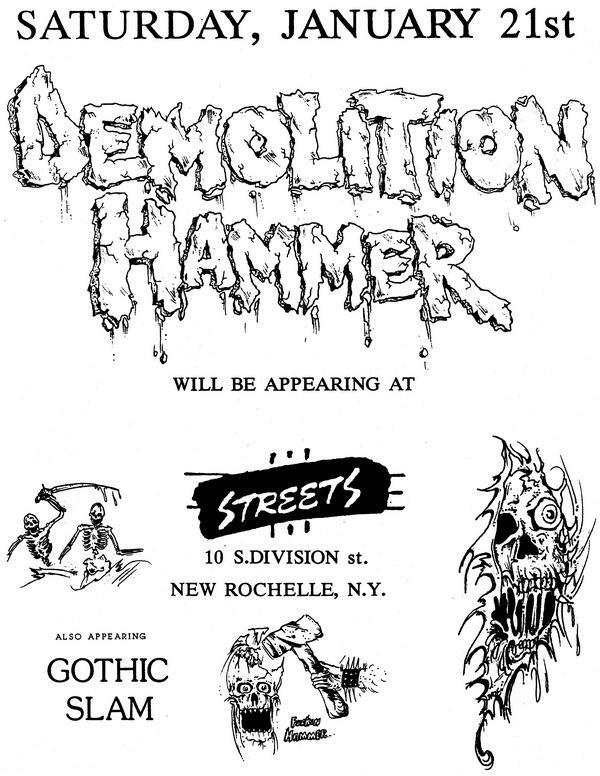 opening for Demolition Hammer. 02/03/1989; Concert at Streets, New Rochelle, NY, USA. 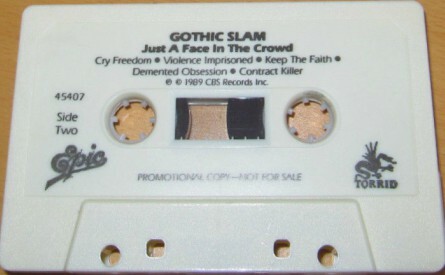 opening for M.O.D. 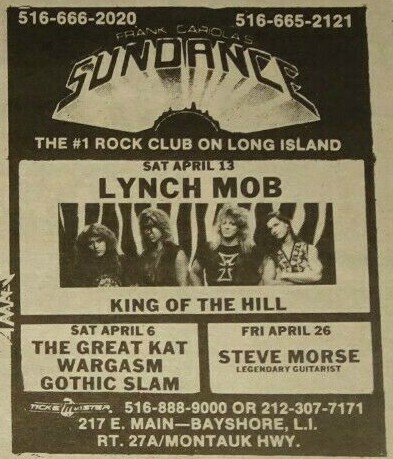 17/03/1989; Concert at L'Amour, Brooklyn, NY, USA. 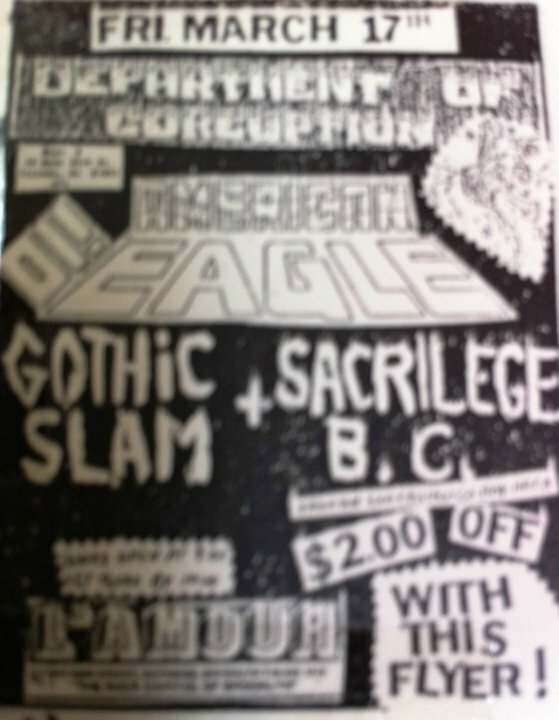 opening for Sacrilege B.C. & Department Of Coreuption. 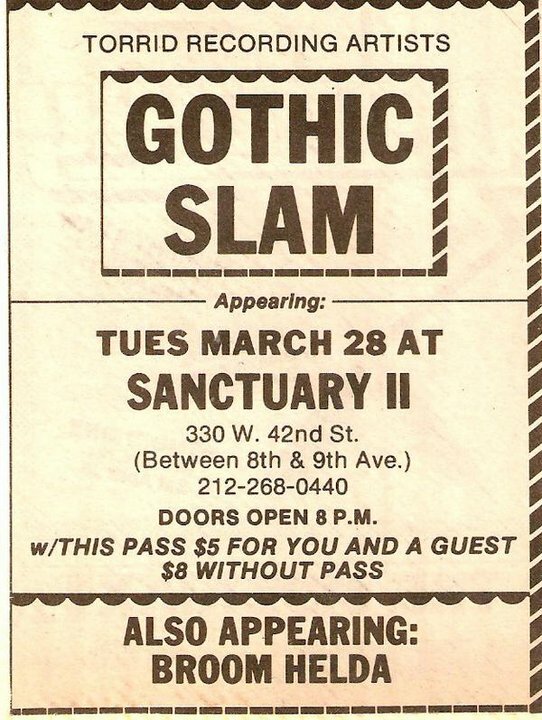 28/03/1989; Concert at Sanctuary II, New York, NY, USA. with Broom Helda. 01/04/1989; Concert at Sundance, Bayshore, LI, USA. opening for Dark Angel & Excel. 20/06/1989; Concert at The Cat Club, New York, NY, USA. 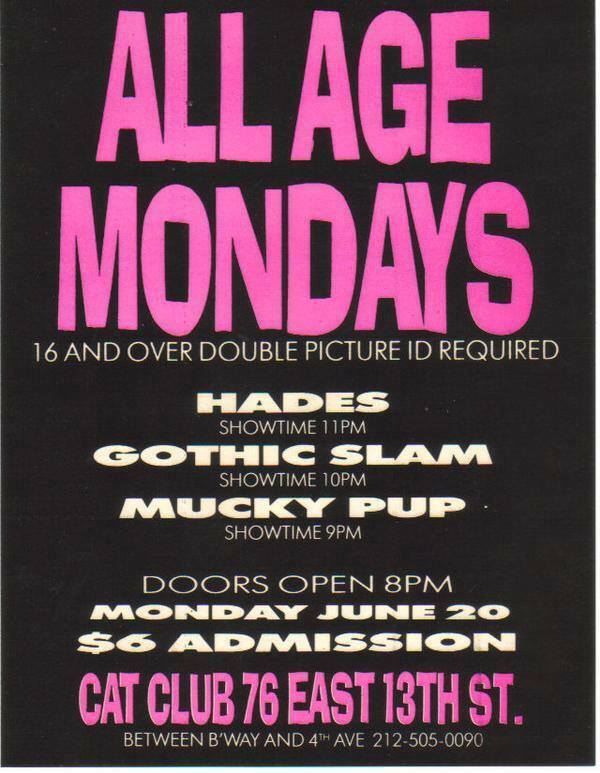 opening for Hades, with Mucky Pup. 12/08/1989; Concert at Tompkin's Square Park, New York, NY, USA. opening for Mucky Pup & Prong, with Faith Or Fear & asst. 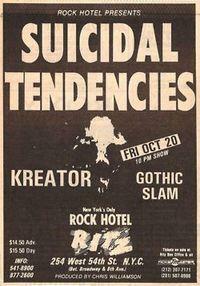 20/10/1989; Concert at The Ritz, New York, NY, USA. opening for Suicidal Tendencies & Kreator.
? 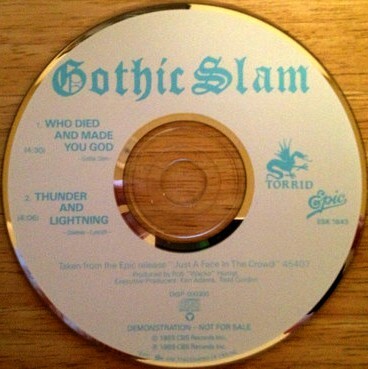 ?/10/1989; 'Who Died../Thunder & Lightning' promo single released. 31/10/1989; 'Just A Face In The Crowd' album released. 02/12/1989; Concert at Central Park Ballroom, Milwaukee, WI, USA. 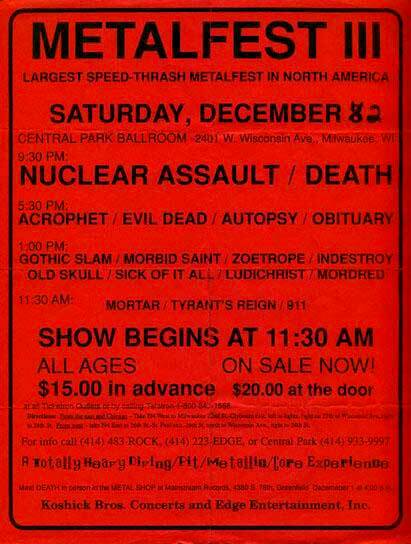 with Death, Nuclear Assault, Obituary etc..
05/12/1989; Concert at City Limits, Pittsburgh, PA, USA. 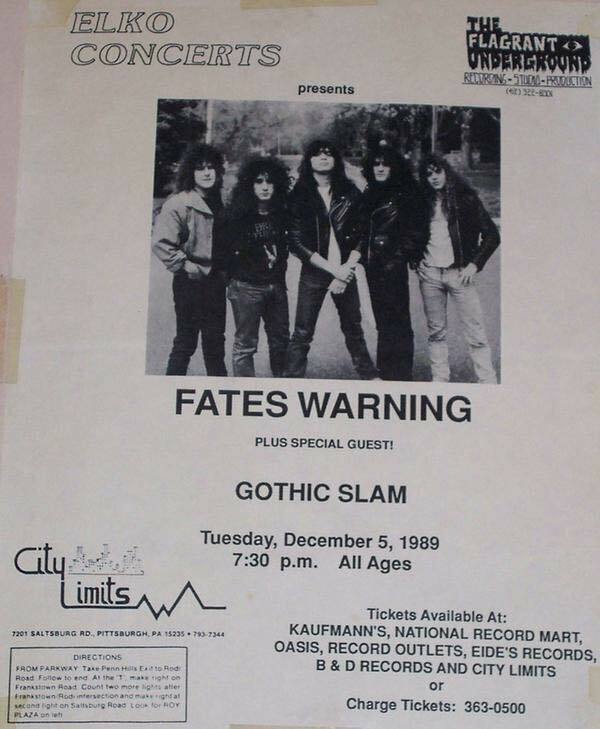 opening for Fates Warning. 23/12/1989; Concert at Sundance, Bayshore, LI, USA. 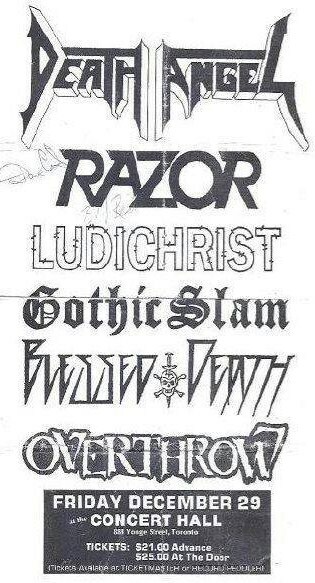 opening for Ludichrist, with Toxic Shock & Mucky Pup. 29/12/1989; Concert at The Concert Hall, Toronto, ON, Canada. 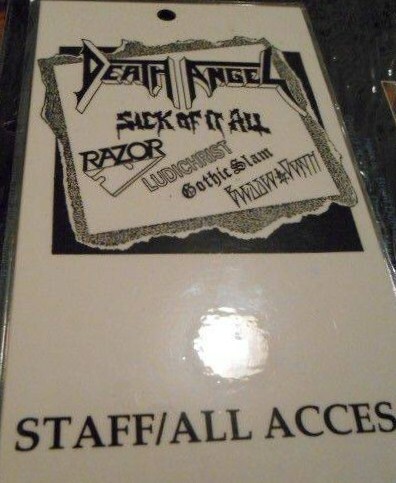 opening for Death Angel, C.O.C. & Razor, with asst. 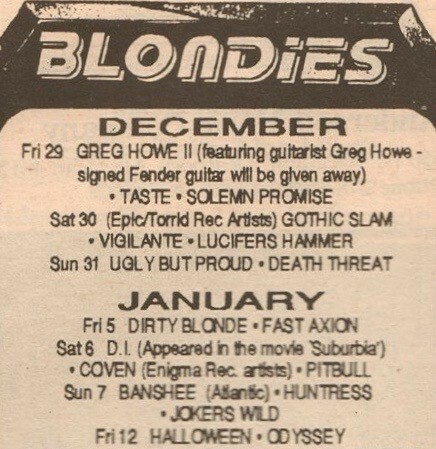 30/12/1989; Concert at Blondie's, Detroit, MI, USA. with Vigilante & Lucifers Hammer. 06/01/1990; Concert at Streets, New Rochelle, NY, USA. with I.N.C. & Bar Sinister. 03/02/1990; Concert at Sundance, Bayshore, NY, USA. opening for Laaz Rockit, with The Beast. 05/02/1990; Concert at The Bayou, Washington, DC, USA. opening for Laaz Rockit. 13/02/1990; Concert at Foufounes Electrique, Montreal, QC, Canada. 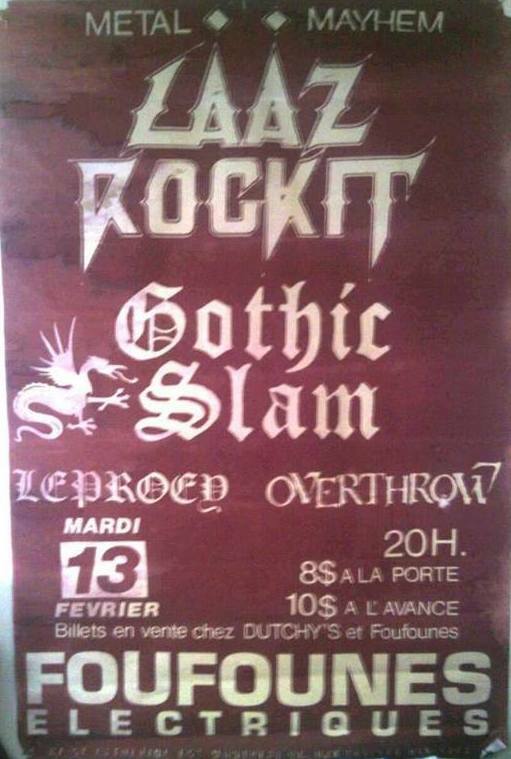 opening for Laaz Rocit, with Leprocy & Overthrow. 16/02/1990; Concert at ? ?, ??, ? ?, USA. opening for Laaz Rocket, with Krystal Synn. 19/02/1990; Concert at Peabody's Down Under, Cleveland, OH, USA. opening for Laaz Rockit. 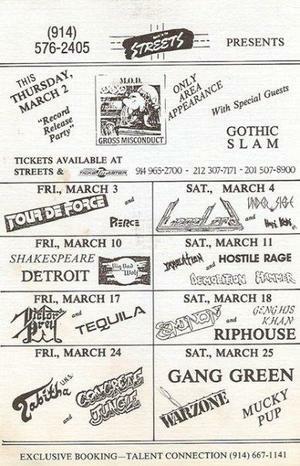 20/02/1990; Concert at Stardust, Lansing, MI, USA. opening for Laaz Rocket, with Sinister Black. 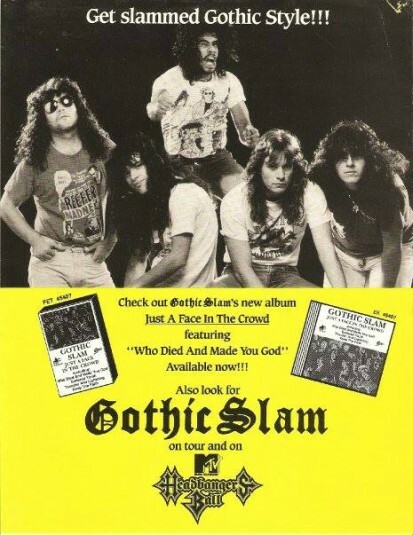 21/02/1990; Concert at City Limits, Pittsburgh, PA, USA. opening for Laaz Rockit. 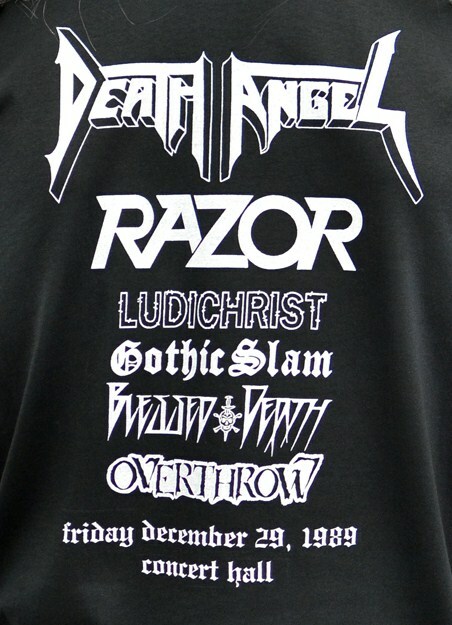 23/02/1990; Concert at ? ?, ??, ? ?, USA. 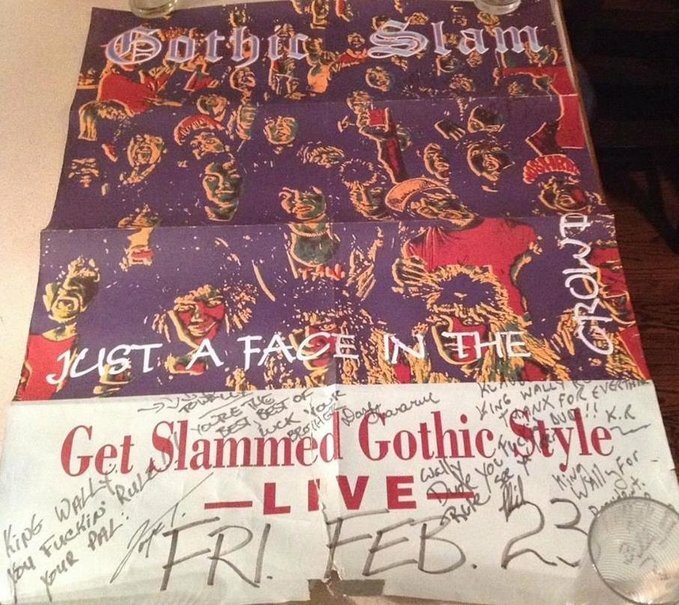 ​24/02/1990; Concert at Croation Hall, Sheboygan, NY, USA. 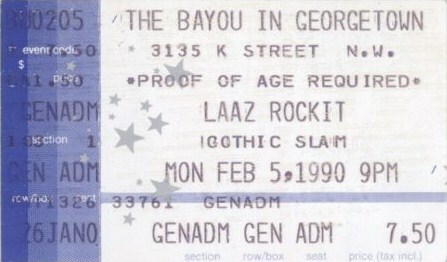 opening for Laaz Rockit. 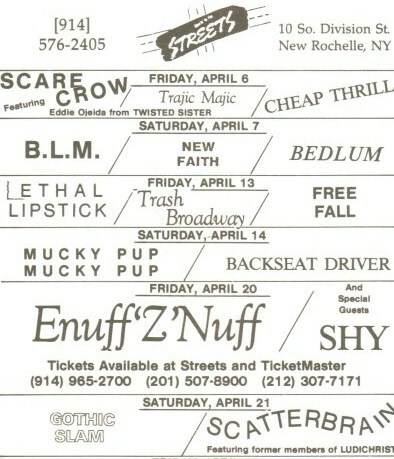 21/04/1990; Concert at Streets, New Rochelle, NY, USA. with Scatterbrain. 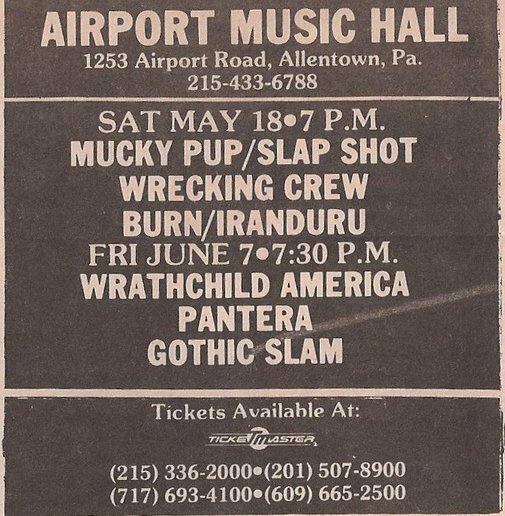 28/04/1990; Concert at The Airport Music Hall, Allentown, PA, USA. 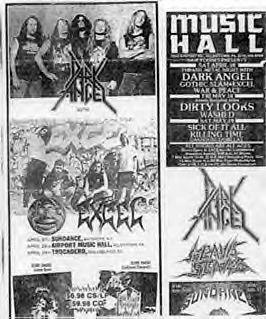 opening for Dark Angel & Excel. 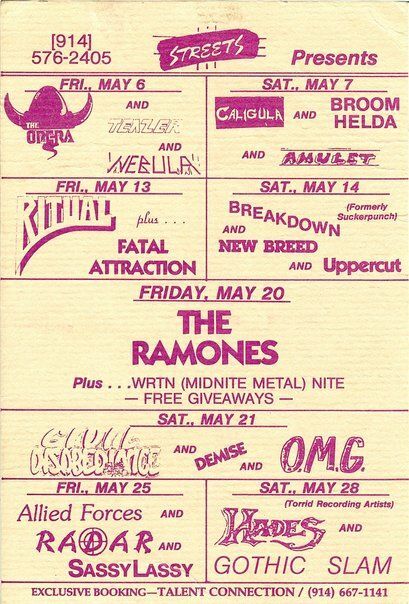 13/05/1990; Concert at Trocadero, Philadelphia, PA, USA. 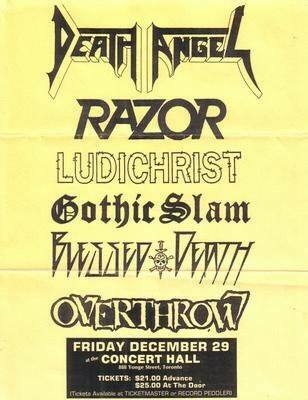 opening for Morbid Angel & Ripping Corpse, with Faith Or Fear. 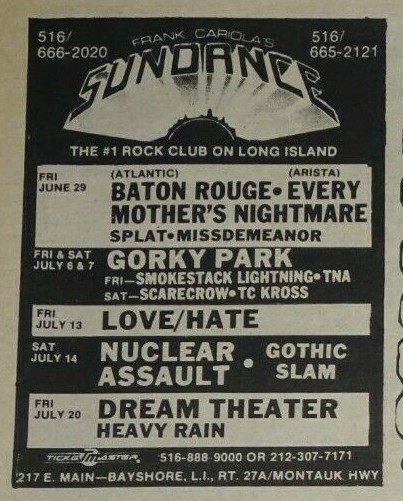 14/07/1990; Concert at Sundance, Bayshore, NY, USA. opening for Nuclear Assault. 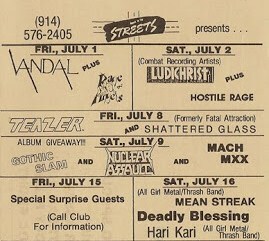 15/07/1990; Concert at Streets, New Rochelle, NY, USA. opening for Nuclear Assault, with Harter Attack. 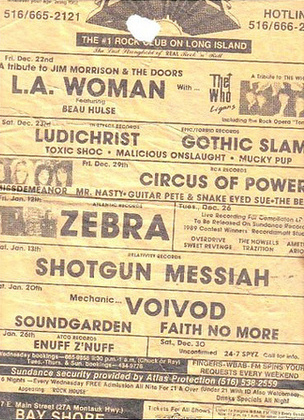 24/11/1990; Concert at The Black Cat, New York, NY, USA. 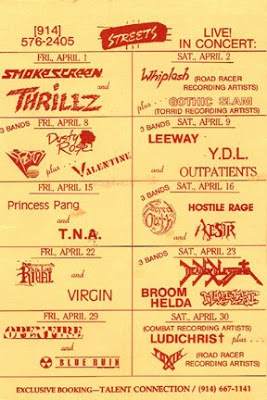 with Savage Grace, Quicksand & asst. 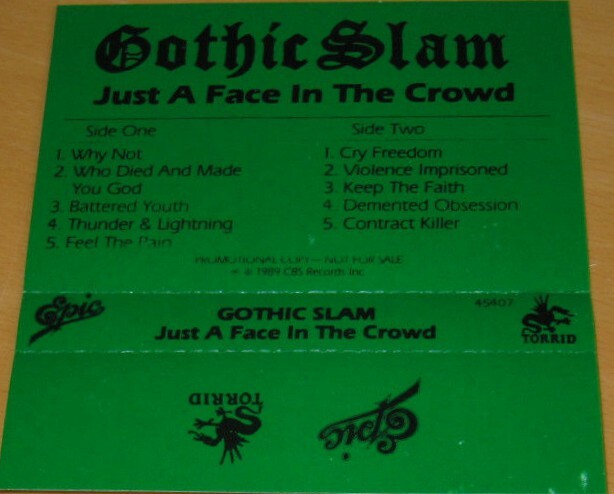 19/01/1991; Concert at Jannus Landing, St. Petersburg, FL, USA. opening for Pantera & Deicide, with Devastation & asst. 06/04/1991; Concert at Sundance, Bayshore, NY, USA. 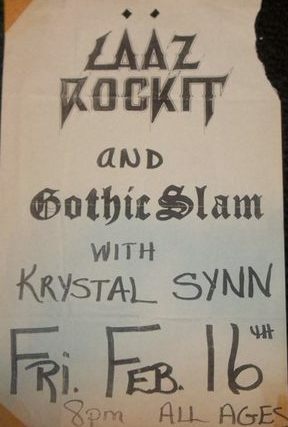 opening for The Great Kat & Wargasm. 07/06/1991; Concert at The Airport Music Hall, Allentown, PA, USA. 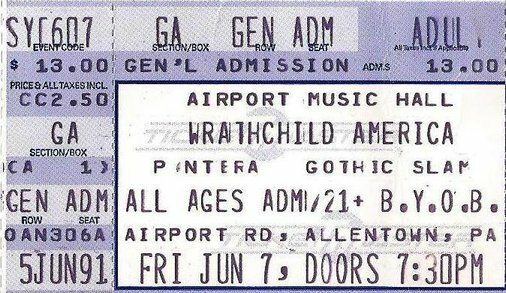 opening for Wrathchild America & Pantera. 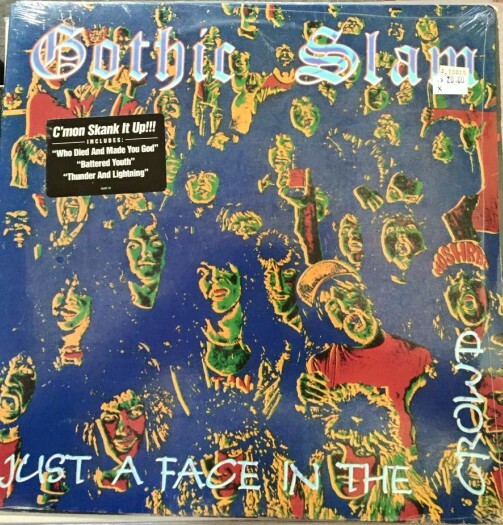 Gothic Slam version 1.0 - 49 entries - 48 images - 17/03/2019.